Saint Lucy was born to a rich and noble family around 283 A.D. Her father died when she was young, so she was raised by her mother, Eutychia; and her mother had been considered to focus much of her own life around wealth and status. Lucy, on the other hand, believed that the poor should be cared for instead of focusing on worldly goods. Because of her will to advocate for the poor, she desired to consecrate herself and her virginity to God; yet was unwillingly forced into an arranged relationship with Paschasius by her mother, which Lucy was able to postpone for a few years. Lucy’s mother developed a hemorrhage which lasted several years, and sought to have it cured by travelling to visit the relics of Saint Agatha who had been executed 52 years prior. Upon visiting the relics, Eutychia was cured; and because of this occasion Lucy saw the opportunity to convince her mother to distribute wealth to help the poor. Because of the healing, Eutychia allowed Lucy to follow her vocation. When Lucy did so, Paschasius was not pleased in losing his future spouse and he had her ordered to be put to death. Some accounts of her last days speak of being accused and condemned of prostitution, as well as set on fire, but God saved her because of her great devotion. While other accounts speak of having her tortured to the point of blindness; she eventually was put to death by the sword. She died in 304 A.D. and has been declared a martyr by the Church. 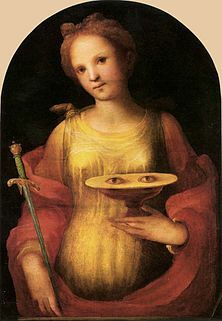 In iconography, the emblem of eyes on a cup or plate apparently reflects popular devotion to her as protector of sight, because of her name, Lucia (from the Latin word “lux” which means “light”). In paintings St. Lucy is frequently shown holding her eyes on a golden plate. Lucy was represented in Gothic art holding a dish with two eyes on it. She also holds the palm branch, symbol of victory over evil. In today’s first reading from Zephaniah, we see that God is angry with the people for the negative actions, therefore Zephaniah declares he shall make things right with God, that way God will no longer be displeased. He declares that he shall purify the hearts of people, and rid them of the wrongdoings against others. He sees that it is the right thing to do in order for the people to have a relationship with God. In the Gospel, we read that Jesus is challenging the chief priests and elders about their conduct. He uses the parable of two sons being asked to go out and work in the vineyard by their father; one initially refuses to work but eventually does go out and works, while the other son says he will work but never does. Jesus asks the chief priests and elders which son did his father’s will, and of course they answer him by saying the first son. Jesus affirms that they are correct, yet challenges them by telling them that they have “talked the talk, but not walked the walk.” Their actions speak of following God, but they have consistently done the complete opposite – just like the second son in the parable. Jesus points out that there have been people who have turned from their bad ways, and chosen to follow God and who are, therefore, like the first son, and will enter heaven before the chief priests and elders. The life of Saint Lucy connects with these readings very well. She possessed the same mentality and conviction as Zephaniah. She knew that there was injustice in society and felt it was her calling to make things right. Lucy’s influence, growing up in wealth, yet desiring to consecrate herself to God and help the poor, ties in with her whole life being like the first son in the parable. She answered the call to help the poor instead of continuing the tradition in which she was raised. She saw that it was her vocation to do what was right, and actually follow through with the cause until the very end. She could very well have been like the second son by acknowledging God but continuing to bask in wealth and do nothing. Saint Lucy is somebody who we should look to as an example as a way of living. Granted her story is about distributing wealth to the poor, that is only one form of a vocation of helping people in need. Everybody has gifts and talents which can be applied to help others. During my first journey in religious life, I was fortunate enough to know a religious sister who facilitated a ministry center which offered many community outreach programs to help the lives of those in need. The center offered after school meals, a program for immigrants to learn English, as well as classes to learn Life Skills. This sister knew it was her calling to provide the local community with the necessities of life. Yet what are WE going to do in order to be like Lucy; or the first son, if we turned from bad ways? Do we have resources which we are not fully sharing; money or simply time to put toward a ministry? Can we be like this sister I knew? Is there a whisper in your ear from God which you hear, but to which you are responding? Are we wanting to be like the second son, who says yes but then does not act on that yes? We have a week and a half before Christmas, so maybe this might be a time to reflect upon if there is something which we are called to do. Father, may we be like Saint Lucy, and open our eyes and ears to recognize our true vocation in life. May we follow her example to be of presence and assistance within our own communities, and be like the first son who ultimately says yes. This we ask through Christ, Our Lord. Amen. Thank you, Michael! A good example to follow!